Dr. Dorothy Pringle’s research has concentrated on the quality of daily life of older people who are cognitively impaired, and focused on those who live in long-term care facilities and their family caregivers. She has researched sources of pleasure in the daily lives of residents with advanced cognitive impairment who live in nursing homes, as well as the quality of relationships between nurses and patients in residential settings. She serves as a Council Member of the Gerontological Advisory Council of Veterans Affairs Canada. At U of T Nursing, Dr. Pringle served as Dean from 1988 to 1999 and was instrumental in strengthening its research focus and launching the first doctoral nursing program in Ontario. Among her numerous awards, Dr. Pringle received the Jeanne Mance Award from the Canadian Nurses Association for lifetime contributions to nursing. 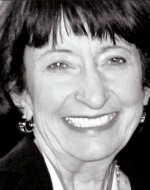 She received honorary Doctor of Laws degrees from universities in Lethbridge, Alberta; Laval, Quebec; and Sudbury, Ontario, and is a Fellow of the Canadian Academy of Health Sciences. Dr. Pringle’s PubMed link is available here.